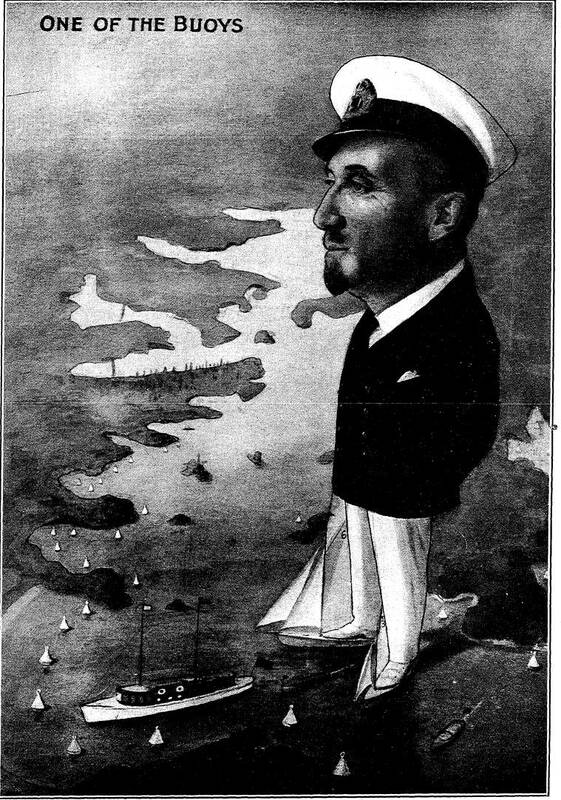 Marjorie Pritchard’s caricature of Frank Albert, c 1929. Published in The Australian Motor Boat and Yachting Monthly, 1 August 1929, page 7. All images courtesy Australian National Maritime Museum. It was a clear and crisp autumn afternoon in 1925 when ‘one of Sydney’s show yachts’ sailed up to the Man-o’-war steps in Farm Cove, Sydney. Father and son, Frank and Alexis Albert, were about to host an afternoon with the Governor and his daughter on board their 54-foot cutter, Rawhiti. This was a long way from 41 years previously when, again in Farm Cove, Frank was just 10 years old and first set foot on Sydney’s unfamiliar shores. This tale started for me when one of our Flickr Commons investigators recognised Frank and Alexis in a Samuel J Hood photograph. As I delved deeper into the Albert family history, I became more and more fascinated by their remarkable story. It tells of a journey to the unknown, of new beginnings and innovation. In many ways, the Alberts sailed through Australia’s “golden years”, not just on Sydney Harbour but through that other “golden age” – of rock n’ roll. This is part one of their story. It begins on 10 December 1884 in Farm Cove, where a Swiss watchmaker, violinist and author and his family stepped ashore to start a new life. Jacques Albert, his wife Sophie and children Michel François (later Frank) and Pauline, had just spent a six-week voyage on board SS Duke of Westminster from Port Said, Egypt to Brisbane, Queensland. Though Jacques, suffering from incessant seasickness, did not enjoy the voyage, he passed much of his time learning English from a 24-year-old Welsh umbrella-maker he befriended, one William Morris Hughes, who later became Australia’s seventh Prime Minister. From Brisbane, SS Eurimbla took the family to Sydney where Jacques set up a watchmaking shop in Newtown. Photographer: Samuel J Hood Studio. After his wife Sophie died in 1890, Jacques set up Albert’s Music Stores in Sydney’s CBD at 118 King Street. According to Jane Albert (House of Hits: The great untold story of Australia’s first family of music, Melbourne: Hardie Grant Books, 2010), from an early age, Frank had developed a ‘tough, uncompromising determination that would drive him through his successful business life.’ By 1894, Frank had become a partner in his father’s business which had changed to J Albert and Son. He had developed the business further in 1890, by releasing the first of the Boomerang Songsters, a music compilation which sold in its millions for the next 80 years. By May 1894, Frank had begun the process of trademarking the word “boomerang” and its symbol as J Albert and Son’s unique brand. One of his most famous moves, in keeping with the new brand, was to create an affordable, portable and simple form of musical entertainment for consumers in the form of the Boomerang mouth organ. Frank also named his Elizabeth Bay Spanish-style home ‘Boomerang’, which is now heritage listed. 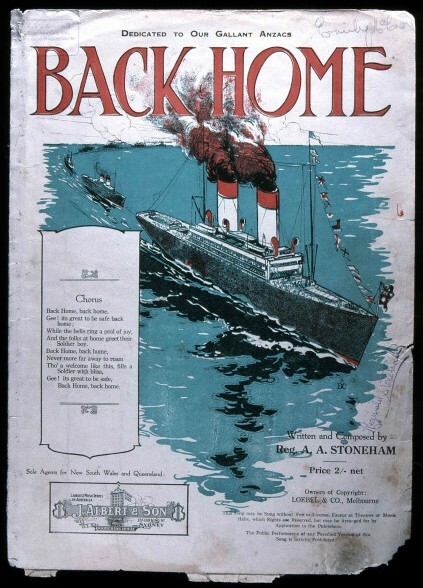 Back Home, published by J Albert & Son c 1918. This sheet music was sold at the affordable price of 2 shillings. Music publishing was J Albert & Sons’ ‘main staple’ (Albert, House of Hits, p 4). Unlike his father, Frank developed a passion for boating, a passion he was to hand down the generations. He became interested in the sport as early as 1900 when he obtained his first boat, a motor launch called Gromoboi. Shortly following his first purchase, he exchanged Gromoboi for a 25-footer of the same name. 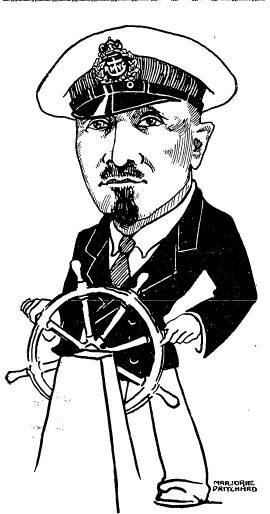 In 1905, Frank was a founding member and rear commodore of the Motor Boat Club (later Royal Motor Yacht Club) and served as its commodore from 1912 to 1920, which, according to the Australian Motor Boat and Yachting Monthly (AMBYM) of May 1925, was a record for the club. 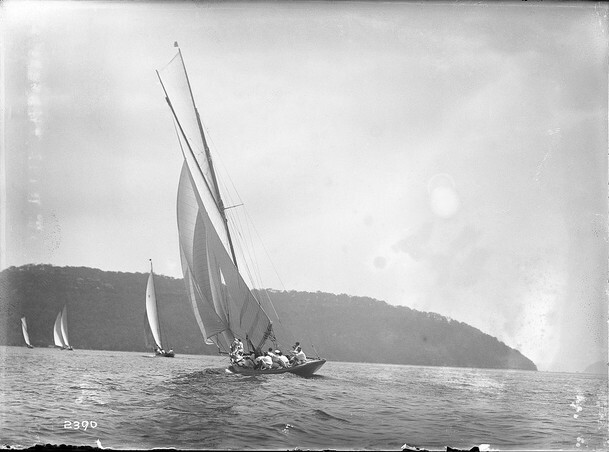 Frank donated various cups to the sport including the Albert Cup and Rawhiti Cup; however, it was for his yachts that he became known throughout the boating community. Though Frank purchased numerous motor boats and vessels, including the 30-foot launch Fedora, he turned his sights completely to sailing when he purchased the New Zealand cutter Rawhiti in December 1909. 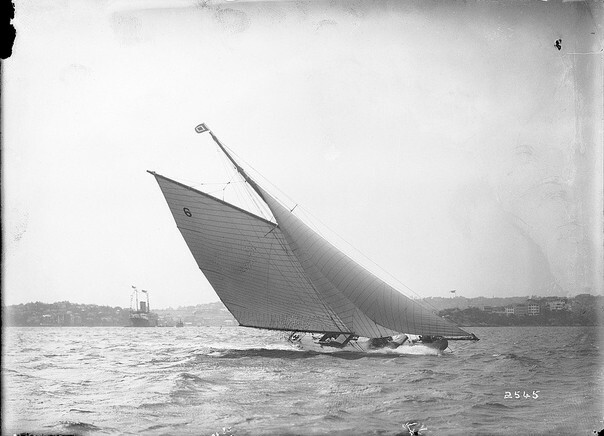 The yacht was designed and built in Auckland in 1905 by New Zealand’s leading yacht builders, the Logan Bros. 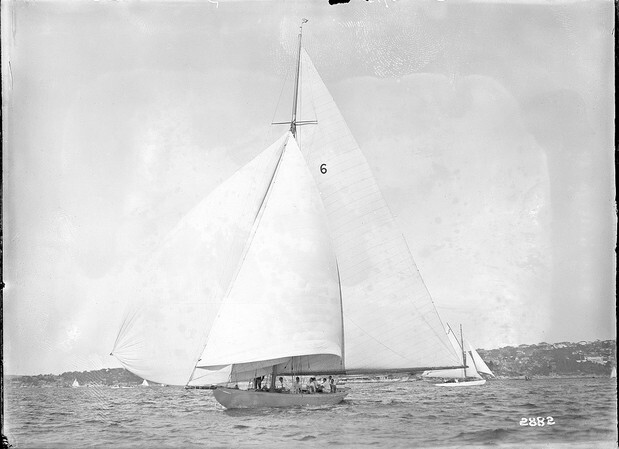 It was owned by New Zealander, A T Pittar, and was then sold to C T Brockhoff, a champion skipper. It then passed to Frank along with his associate E E Sayer, whom he met in 1902. Together, they skippered the craft interchangeably over the next 16 years. Shortly after they purchased it, the pair commissioned the well-known marine architect Walter Reeks to ‘take her lines off and do what he thought best to bring her up to the highest standard of perfection’ (SMH, 13 Sep 1910). According to the report in The Sydney Morning Herald, the ‘lead keel was remoulded’ and a ‘complete set of new spars and iron work’ was fitted. The green topsides were retained and the underbody was painted a distinctive pink, a colour it has retained to this day. Interestingly, Frank had a penchant for the colour green, even signing his letters with green ink, so it is no surprise that he chose to retain the ‘Eau de Nile’ shade of green for his prize yacht (Albert, House of Hits, p 56). Her owners were confident; Rawhiti would ‘be a hard nut to crack’. It seems no truer words were spoken, as not long after Rawhiti hit the water on 10 September 1910, she won the championship for the Royal Prince Alfred Yacht Club and the Blue Ribbon the following year. Frank and Sayer went on to win numerous trophies and titles over the years, including the Basin Cup of 1912 and the Gascoyne and Revonah Cups and Marshall Plate of 1925. A film depicting Frank and his crew on board Rawhiti was shot in 1925 after they won the Rawson Cup outright. The film is now held in the National Film and Sound Archive of Australia and is an invaluable historical artefact, documenting not just Rawhiti itself, but the crew rigging and manoeuvring the craft around the harbour. How do you account for gathering the honor again if the handicapping was against you? … The only reasons I can give … were that my boat was always right up to concert pitch; my crew sailed every race right out to the bitter end; and it was the seconds and thirds that I gathered in that made up the points that brought the championship. Handicappers in every sport have a thankless task to perform, but when one particular boat seems to be singled out for harsh treatment, is it any wonder that questions are asked? In practically every race she has sailed, Rawhiti has had no chance whatsoever of winning, yet she was on the mark each Saturday, prepared to take the gruelling skipper and crew knew was inevitable. After the season, Sayer stepped down as skipper due to ill health. 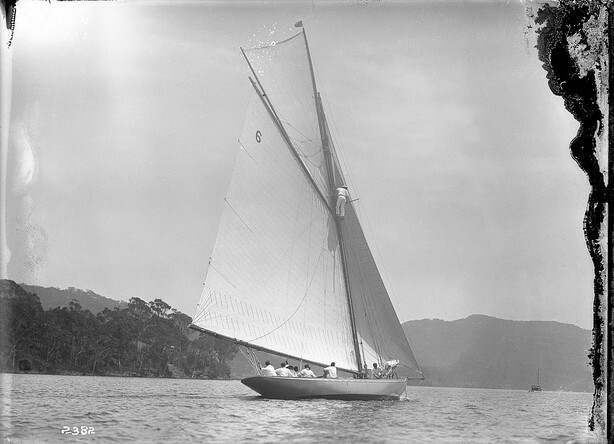 As Rawhiti neared the end of her stellar run, further complications arose after she was rerigged in 1927. One story notes that the new Bermudian rig designed by William Fife and Sons was disastrous as, during its first outing, Rawhiti collided with another yacht and the rigging and mast were destroyed (Albert, House of Hits, p 50). 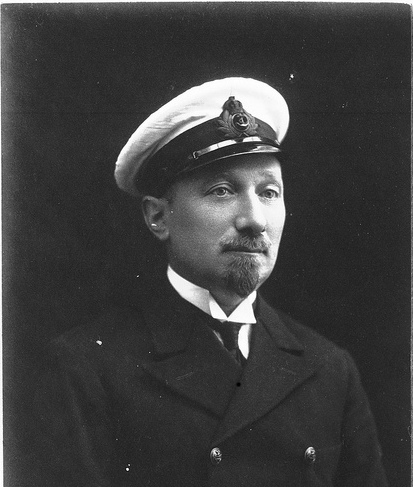 Throughout the 1930s Rawhiti did not retain her earlier dominance, despite Frank’s best efforts to induce his son Alexis to take the helm after Sayer. Toward the end of World War II, Rawhiti was sold to new owners from New Zealand. And yet, despite her apparent decline in the sport, Rawhiti continues to excite and enthral as she still races today. This graceful yacht remains one of the few instances in the William J Hall photographic collection, let alone in the entire National Maritime Collection, where one watercraft appears so thoroughly documented. Rawhiti is depicted from all angles in all her beauty, participating in one of Sydney’s most popular pastimes. 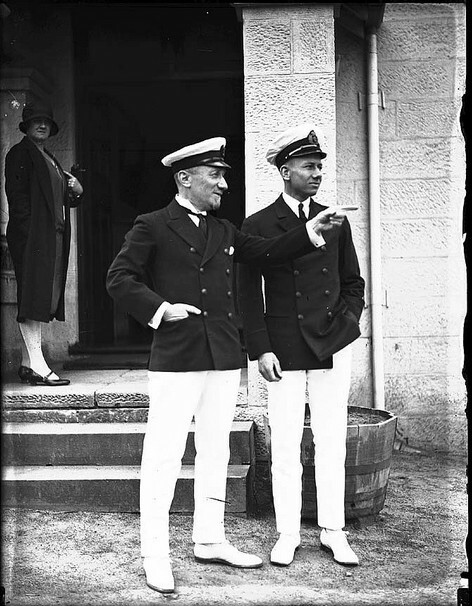 It is a testament to Hall’s admiration for the yacht that we have access to such an extraordinary array of photographs. In all this, two crucial elements dominate the Albert story. As I delved into the museum’s collection of sheet music and historic photographs as well as the various newspaper archives available online, I realised it was impossible for me to separate the sailing from the music. The two are inextricably linked and there seems to be a parallel between the way that music and sailing featured so prominently in their lives. Even in the way that Frank himself described sailing, such as his statement that Rawhiti was always up to ‘concert pitch’, musical metaphors never seemed far away. Like the crescendo of a song and the controlled timing required of an orchestra, so too is the same discipline and skill required of a sailor as he or she judges and tacks the wind. So, back to 1925, in a moment with the Governor, Sir Dudley de Chair and his daughter Elaine, Frank jokingly says ‘Do you know, Commodore, that in racing, when the wind is a bit sick, we whistle.’ At the tiller, Sir Dudley replies with ‘Good idea … but try scratching the mast with your finger and you’re sure to get a breeze.’ There is something about sailing that frees the soul and releases all inhibition. Perhaps that’s what taking the helm makes you feel; you leave all cares and formalities onshore because out on the waves everyone is the same. 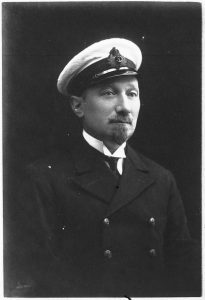 That’s probably why Frank referred to Sir Dudley as Commodore, as it was more fitting and relevant to reference his position with the Royal Prince Alfred Yacht Club. As the ‘Aquatic Man’s Paper’ (the AMBYM) stated in one article, sailors are those men ‘with the call of the sea pulsating through his veins’. And Frank Albert was a sailor, through and through. Frank Albert c 1926. Photographer: William J Hall. NOTE: This piece was originally published on the Australian National Maritime Museum blog on 23 May 2013. Reproduced courtesy of the Australian National Maritime Museum. Read part two of the story on the ANMM Blog.